I was a guess blogger for the Intramuralist this summer - this is a story about both faith and fathers and sons enjoying the game that binds the generations together, baseball. Bad things happen for a reason. In September of 1964, my dad waited in anticipation for two once in a lifetime events: the birth of his first son and the first World Series Championship for the Philadelphia Phillies. The Phillies had never won a World Series before. The closest the Phillies ever came was in 1915 when they lost to the Boston Red Sox. That was 23 years before my dad was born. On September 15th, the day I was born, the Phillies beat the Colt 45s of Houston, 1-0. That victory gave the Phillies a comfortable 6 game lead with 17 games to play. Life could not have been any better for my dad. Then the unthinkable happened. Over the next 15 games, the Phillies lost 13 of them and fell behind the St. Louis Cardinals in the standings. The Phillies won their last 2 games of the year, but it was too late. They finished 1 game behind the eventual World Series Champs, the St. Louis Cardinals, and became the laughingstock of baseball. As soon as I was old enough, my dad talked to me about the Phillies’ collapse, too. I’m sure he was playing back old tapes of conversations that he had with his dad the weeks, months and years following the great collapse. He told me how it happened and who to blame, but he could not explain why it happened. In 1980, while Jimmy Carter was busy creating policies that pushed the misery index to historic levels, the Phillies won the National League Pennant. My dad wanted to go to the World Series, but money was tight. 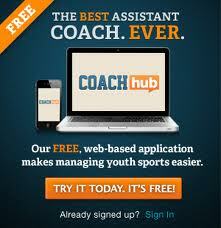 He called some sources but could not find tickets for a reasonable price. He decided not to go. The day before game 6, when the excitement and ticket prices were at an all time high, he changed his mind and purchased 2 seats in right centerfield. He paid a whopping $300. It was not an easy purchase to make, but off we went. It was a cool October night. The stadium was absolutely electric. Steve Carlton pitched masterfully, and the Phillies won their first ever World Series. As Tug McGraw closed out the game and jumped into Bob Boone’s arms, we discovered why the 1964 Phillies collapsed so long ago. The Phillies did not make it to the World Series in 1964, so a dad could watch his beloved Phillies win their first World Series with his first and only son standing right next to him. Don't pass up on once in a lifetime events. 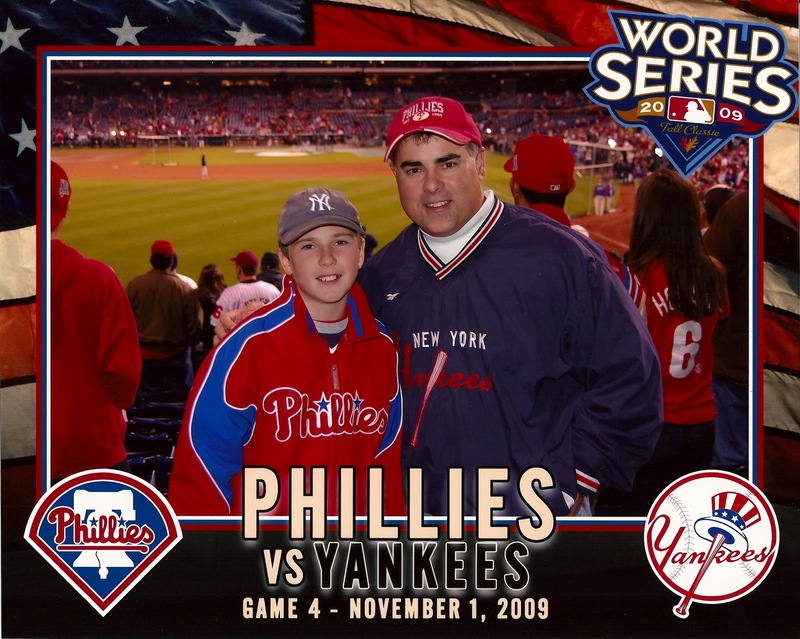 I grew up in the New York area and became as big a Yankee fan as I was a Phillies fan. 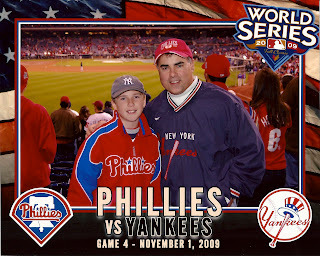 I have always longed for a Yankees – Phillies World Series. Not so coincidentally, my baseball loving son loves the Yankee and Phillies too. In 2009, while Barrack Obama was busy creating policies that only Jimmy Carter could love, the Phillies won the National League Pennant. Like my dad, I hesitated before shelling out a large some of money (tickets and airfare that was more than 10X what he paid). It was not an easy purchase to make, but off we went. It was a cool November night. The stadium was absolutely electric and I was standing next to my son at the World Series.